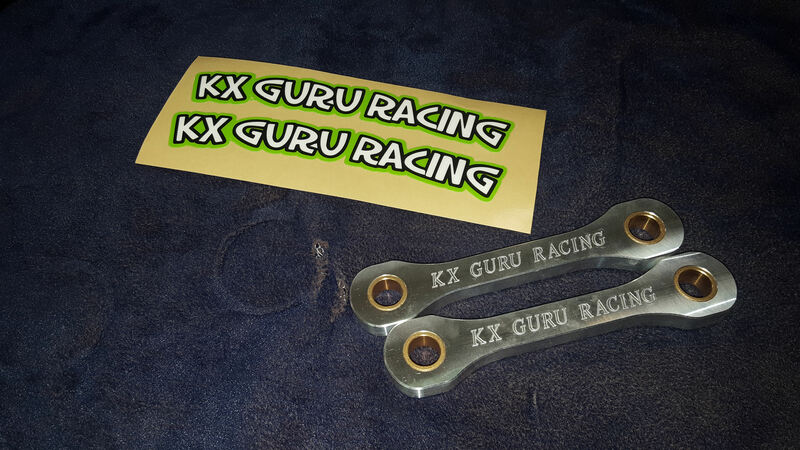 Oscar here and I'm reaching out to my KX500 roots here on kxriders to offer you the products my team and I have began to offer so that you can modernize and set up your KX500 like the boys at Team Green. Keep in mind that Emig Racing does OR did offer these products and we have a good relationship with them. 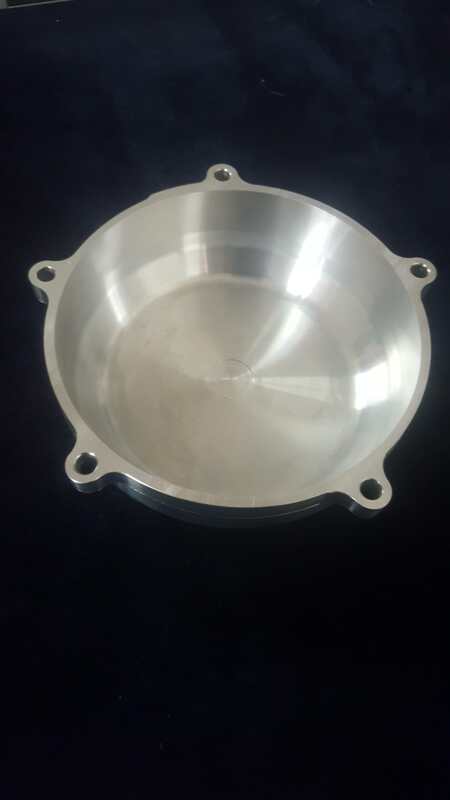 It is us, after all, that worked with Emig many years ago to begin producing the 132.5 mm dogbones. However Emig racing has recently gone through some changes and has become very difficult to contact and deal with. 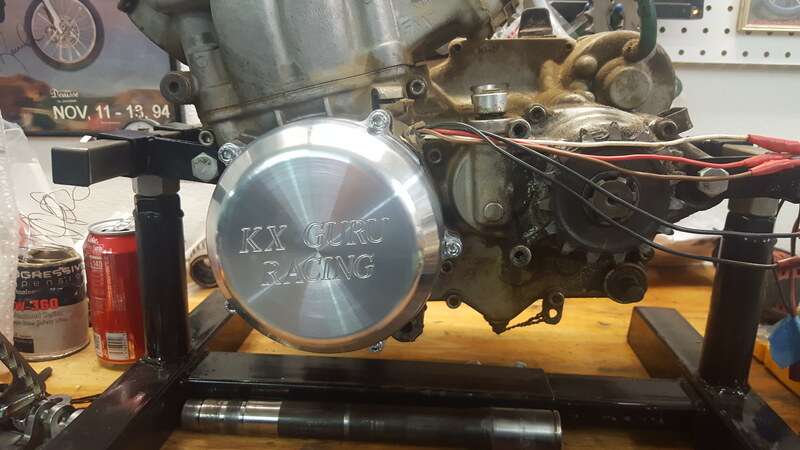 This was one of the motivating factors to begin producing our own products for the KX500 world to benefit from. Below I have listed some of our products with descriptions. You can email me at kxgurusales@gmail.com to place and order or if you have any questions. 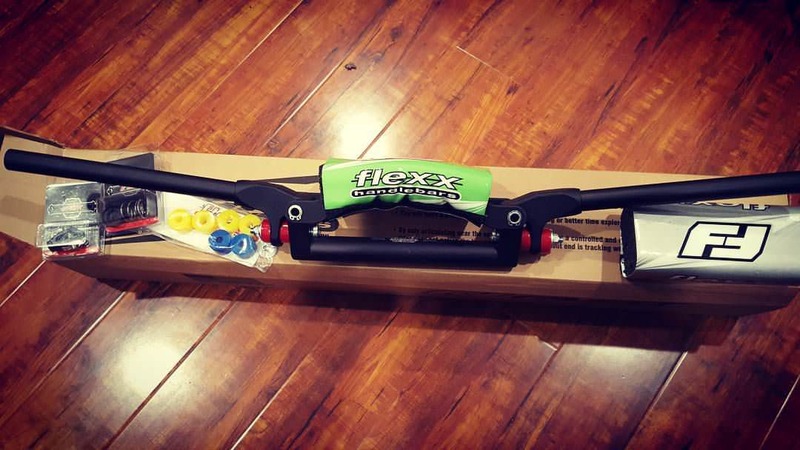 Fasst Company Flexx Bars greatly reduce vibration at the bars and reduce fatigue. Destry Abbott's DA8 KX500 shows what our complete system will look like with the exception of the bar risers. The bar risers in the picture are discontinued by GPR however we are currently working to get them reproduced inhouse. 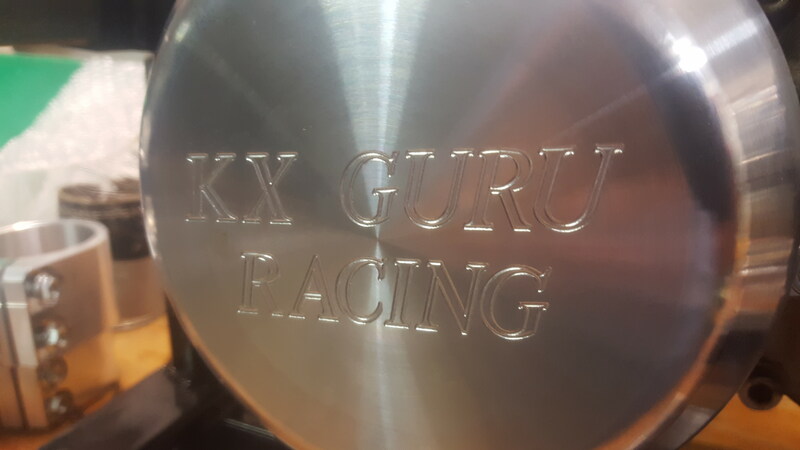 The 1996 and older KX500 stems are .005" or 1/8th millimeter smaller at the base where they press into the lower clamp than the 1997-2004 stems. An older stem CAN NOT be used with newer clamps as the stem will slip into the clamp and will not be a pressed fit. 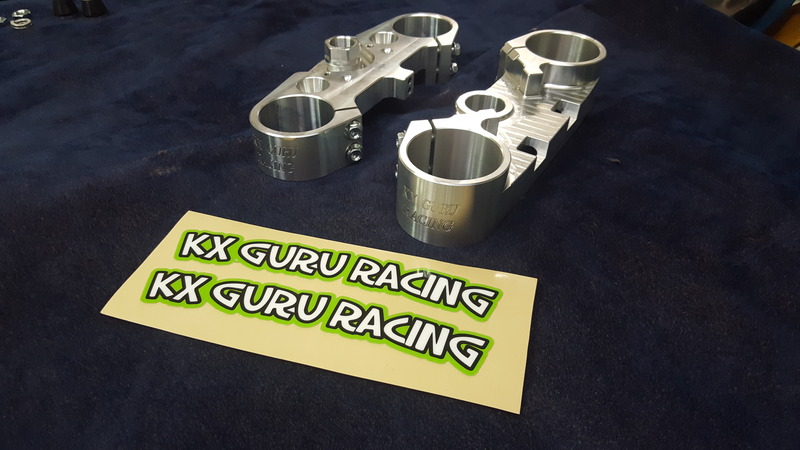 1997-2004 OEM steering stems are still available from the Kawasaki WHILE SUPPLIES LAST but have to be purchased with the lower clamp as an assembly which retails for about $580. Our stems are based off the 1997-2004 dimensions and are the solution for those with pre-1997 bikes who want to upgrade their clamps or for those with 1997 and newer bikes who need a replacement stem. Stock links are 134 mm from eye to eye. 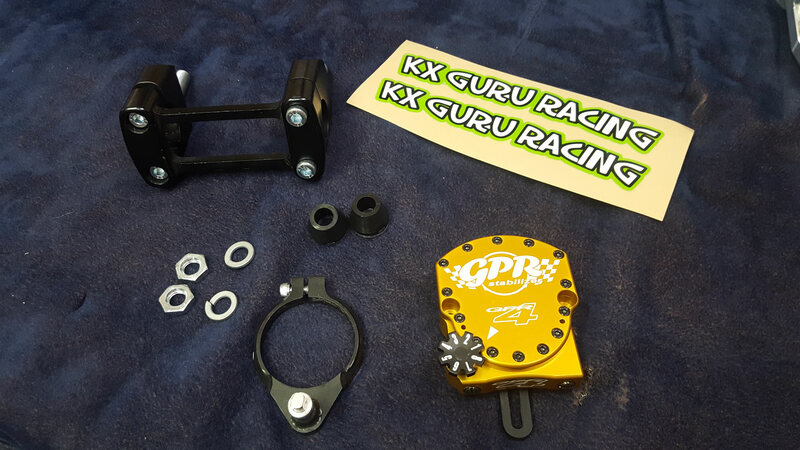 At Team Green we used 132.5 mm links which effectively raised the back of the bike 10 mm to aid in steering and also changed the shock travel ratio which reduces the KX500's tendency to "buck". Years ago I along with a few other KXRiders members contacted Emig Racing to have these bones reproduced. Unfortunately the Emig bones have slightly less material than the stock links to save on manufacturing costs and the holes for the bolts are straight drilled with NO BUSHING. 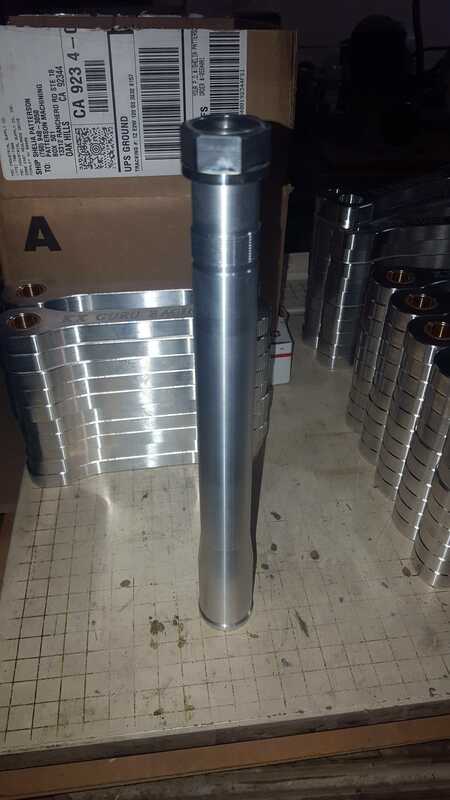 We made our bones to be the same physical size as the OEM links and we used an Oil Lite (oil impregnated) bushing instead of steel to increase life and reduce friction. 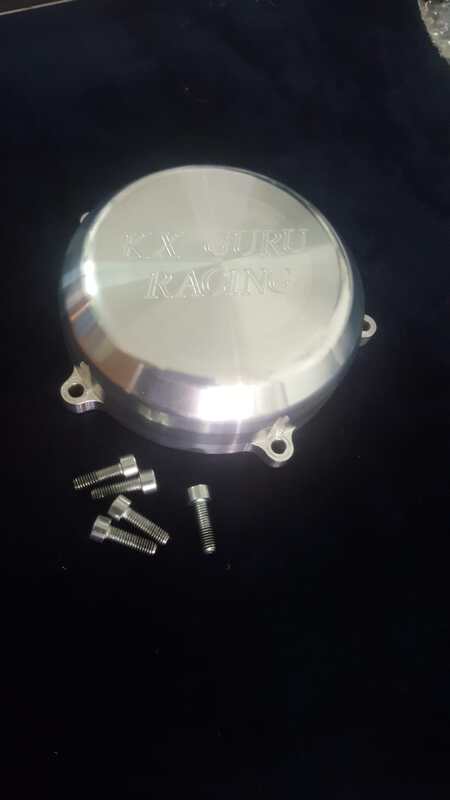 KX Guru Racing ignition/magneto covers are 1 piece solid billet aluminum and an effective way to ditch the old stock plastic piece. Bare aluminum finish allows you to polish, anodize or cerakote to your liking. "How can someone who looks like a high school band tuba player go so d**n fast on a bike?!" hmmm. I thought the 450's used a 48mm chrome OD and a UPPER clamp OD of 53.8mm and a LOWER clamp OD of 59.1mm... I believe that's what these triples are set up for. What year are your forks and what are the OD's measure on the clamping diameters? 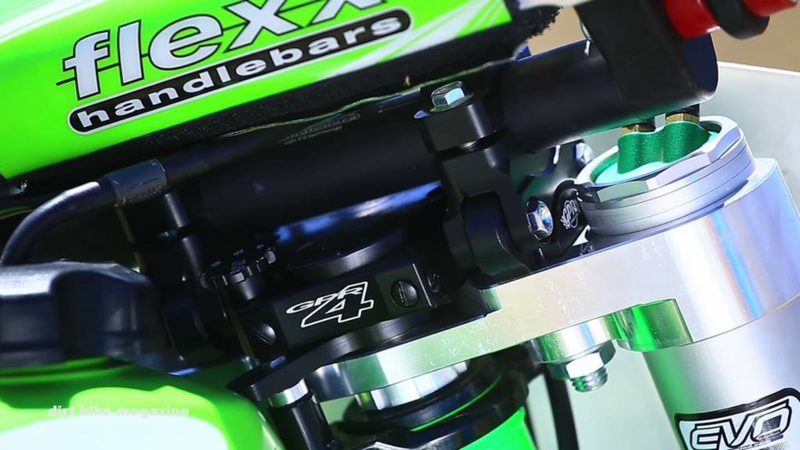 "The KX’s 49mm Showa Separate Function Fork, Triple Air Chamber (SFF-TAC) unit boasts new low-friction seals and updated valving"
"FRONT SUSPENSION 49MM, SHOWA SFF-AIR TRIPLE AIR CHAMBER (TAC) FORK"
Ah... I have sizes up to 2011 recorded. I got the suspension today, the forks measure approximately 55.10 at the top and approximately 59.35 at the lower part where it looks like the clamps were fixed, the digital measure used is a Bluepoint one so should be fairly good, obviously I do not have original RMZ clamps etc to be 100% precise.